Honduras lies between Nicaragua, El Salvador and Guatemala. To the north she has 669 km of Caribbean Sea coastline. The best diving in Honduras is in the Bay Islands. These comprise Roatan, Utila and Guanaja which are part of the Mesoamerican Barrier Reef. Of these, Utila has the better diving, and has the added advantage of being cheaper than Roatan. 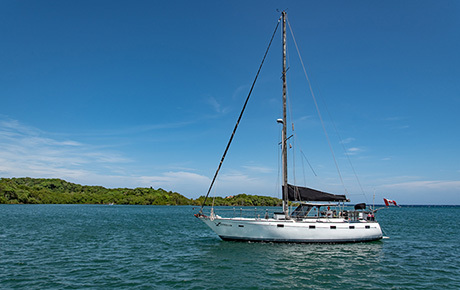 Honduras Liveaboard - Book now & pay later. The best time to dive the Bay Isands is April and May when the weather is warm and dry. The rainy season runs from July to January, with most rain falling from October to early January. This is different to the Honduras mainland. You might see whale sharks at any time of the year but mid February to April are the peak months. Sea temperatures are warm throughout the year, at coldest it is 26 oC at the surface (January and February). Crime levels are high in Honduras, but the Bay Islands are generally safer than the mainland and most visits to Honduras are trouble-free. However, you should take out comprehensive travel and medical insurance before travelling. The British Foreign and Commonwealth Office provides up-to-date travel advice and there are currently no travel restrictions in place to Honduras. Roatan and Utila are only a few miles apart geographically but a world of difference. The diving is similar but everything else is different. Lots of Americans on Roatan, the cruise ships come here 2 times per week and everything gets a little crazy during that time. Lodging, food, diving are all more expensive, yet not any better than Utila. Certain people are attracted to Roatan and others to Utila. I am with Utila. There is a lot of development on Roatan and property values have skyrocketed. All and all, whilst Roatan was OK, I will probably never go there again. However, I would recommend staying at an all inclusive such as Coco View Resort, Anthonys Key, etc. Roatan has a great airport. Utila is the overall best value for your diving dollar. In Roatan, your best value is the all inclusive dive operations. Though some are much better than others. Decent Caribbean diving, but the reefs are not comparable to Cozumel or Indonesia. Fish are plentiful and Whale shark sitings are the best of any place I have been. Utila is the smallest and flattest of the three major Bay Islands, and is the closest to the mainland. The island is 9.5 miles long and 3 miles wide. Land transportation on Utila is limited to a few pickup trucks, a couple of unreliable taxis and a ton of old mountain bikes. Utila is not only renown as one of the best diving locations in the Caribbean, it is also known as the cheapest. 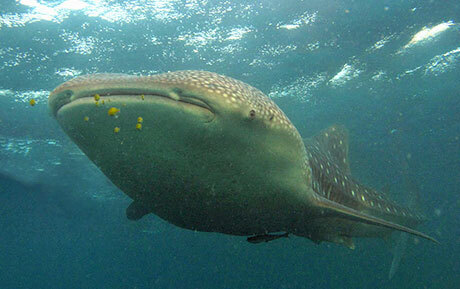 From mid-February through March one can almost be guaranteed a whale shark experience. Consequently, the streets are lined with dive shops. Because certifications are so cheap, many shops have reputations as dive master factories. The best diving in Utila is in the morning. This is when most dive boats go to the "north" side. Also morning offers the best conditions. Unfortunately, I had school in the morning and dived in the afternoon. By doing this I missed two whale shark encounters. There are no bad dive sites on Utila. During my 12 dives, I encountered the largest lobster I have seen in the ocean (20-25 pounds) several barracuda, jaw fish, octopus, spotted drums, sea turtles, moray, scorpion fish, crabs, hog fish, lizard fish, large sting ray, eagle rays, corals, sea fans, sponges and much much more. The dive sites included a spectacular seamount at Black Hills; Rons Wreck - unimpressive as a wreck dive but lots of sea life, saw the green moray here; Airport reef (a good night dive); >Blue Bayou, where I saw 2 turtles, barracuda and the "giant" lobsters; Black coral wall (2 deep dives here-good), Jack Neil; Big Rock and Cabanas. The visibility ranged from 20-30 m. Though I did a couple of deep dives (36 m) the best diving is between 12-20 m.
The North side of Utila is interesting diving but not any better than the south side. The visibility ranged from 60 to 100ft. Depths were 40 �90ft. Most dives are wall dives except for Black Hills which is an incredible seamount. 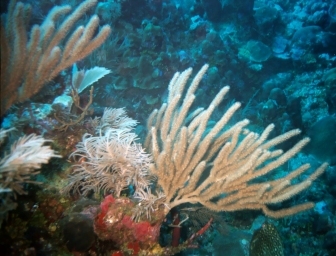 Corals and sea life are prolific in Utila. All the dives were excellent. Three out of 5 days of diving Utila we dove with Whale Sharks. "In Honduras, Utila is the place for budget divers. I didn't see as much biodiversity as in Belize, but it was still great diving. I think Captain Morgan's was the most economical. They have their accommodation on a tiny cay called Pigeon Cay where there is a settlement of locals (very unique). I got certified there in 2006 and had a great time. " On the northern side of Utila. Duppy is a local word meaning ghost, so called because the water sparkles strangely at night. A reef wall sloping down with many channels. "The Canyons dive site (Utila) has beautiful coral gardens and canyons." "Ocean mound, thousands of fish, enough coral to fill a textbook, great." "100 ft + visibility, descending pathway through old coral reef eastward to deeper water. culminating with deep water exit at 140+ feet." "Go for the awesome reef, visibility, 1000's of fish species, stay for the night dive to witness the 'string of pearls' and performing octopus." "Diving was good, not excellent. I expected to see more critters. Reef was is pretty good condition. Boats do not have to travel far to get to get to the dive sites." This cargo ship was deliberately sunk in 2002. It is 300 feet long, one of the largest in the Caribbean. The bow sits at an angle of nearly 90o whilst the superstructure of the stern is at a 30 degree - which makes swimming through quite interesting. Few fish but the primary coral colonizers have found it and it is becoming more and more decorated. 34 m at its deepest point. "Go for the awesome reef, visibility, 1000's of fish species, stay for the night dive to witness the 'string of pearls' phenomenon with lively octopus, crabs and spotted lobsters." "A very rarely dived site, on the west tip of the island. Very very healthy, good chance of Hammerheads." "Coral reefs with neon colored fish. 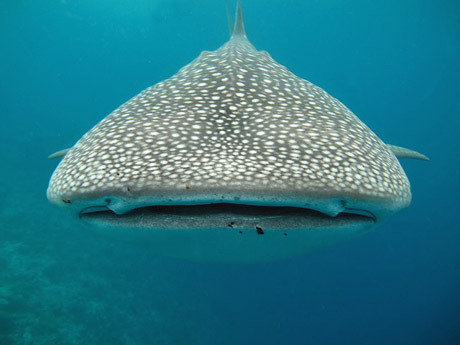 Whale sharks in winter, and a great depth visibility." 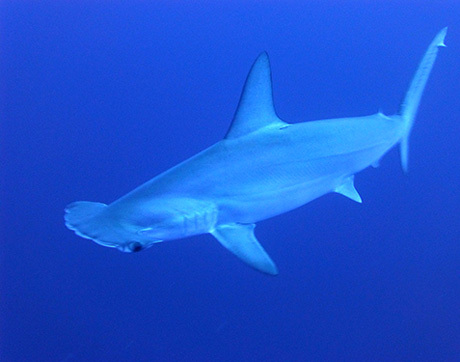 "My husband and I did a shark dive in Roatan in December 2005. It was a great dive. Approximately 22 caribbean reef sharks up close and personal. You can actually swim around with them at 70 ft in a place that is called "Cara a Cara" - face to face." "Shark dive, 10 to 30 Caribbean grey reef sharks. Plateau at 24 meters, plastered with soft and hard corals and fish. Schools of yellow fin tunas, big groupers, moray eels and of course the sharks!" "Great coral, seahorses, snapper, grouper, several moray's, several lobsters. Dolphin pod swam by while diving, very cool!" "Excellent! A little freaky as you swim in crevasse at 70-80 ft. 100 ft visibility. " "Thousands of fish, beautiful coral, fascinating creatures." Wall dive. Loaded with fish. Saw a Hammerhead shark, Octopus, Jewfish and Giant Crabs. Excellent for pictures on this reef. Beach dive right off the hotel dock. Short swim. Shallow, not more than 25' lots of small sealife. Clarity was not the best but it was an easy fun dive. I did my AOW certification in Guanaja. At the time, there was one dive resort. Me and another diver were the only divers on the island for the whole week! I liked that, but not everyone would. I noticed a lot more nurse sharks there than in Utila. Other than that it was similar, but a bit more expensive. The SV Zeppelin is a lovely small liveaboard which takes just four guests. There is a Master Suite, which has a queen size bed, a forward suite which can be used as a large single or double and the passageway cabin with two bunks which is perfect for single travellers or children. It is owner-operated. 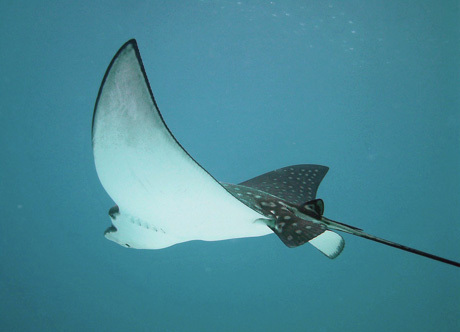 Although called the Roatan Aggressor, this liveaboard also visits Utila and the Cayos Cochinos. 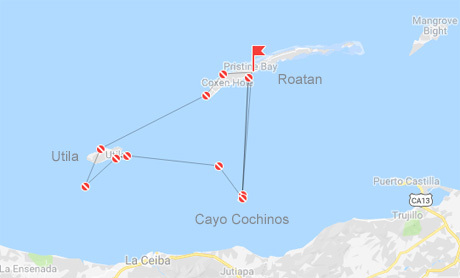 Cayos Cochinos are two small islands (Cayo Menor and Cayo Grande) and several small coral cays. The Cayos Cochinos are a Marine Protected Area. The trip starts and ends at French Harbour in Roatan. You need to have done at least 40 dives and be Advanced Open Water or equivalent. Visits dive sites like The Odyssey, Mary's Place, Black Hills and Duppy Waters. "My husband and I (both in our 50's) had never dived before and were quite nervous. Our son did his Divemaster with Utila Watersports so naturally we dived with them doing both openwater and advanced. They are an extremely professional dive shop and made us feel very welcome and got rid of our nerves. We would recommend them to anyone. The dive sites were great and clarity of water better than Thailand where we have been since." "I spent a very happy 3 months, gaining my dive master at Utila Watersports - a fantastic, friendly, very small diving shop/school, with only 3 instructors. It is true that Utila churns out alot of dive masters and the quality of the school depends on the quality of the dive master turned out, however for all potential dive masters a good thing to remember is that there are so many students that pass through Utila that you gain a lot of experience very quickly. If you want to do your dive master (or any padi course) shop around, ask to check quality of gear, boats, find out how and who does their air and nitrox, what class tuition you get and the level of mentoring / supervision as a dive leader, do they teach you specialities for free (e.g. deep, nitrox, wreck, etc) chat to current dive masters. Some shops operate a strict rota about when you can dive, others let you out as much as you can fit in. The diving there really is second to none, but don't expect to practice your spanish on Utila, it's almost totally English / Patois / Creole / Spanglish !" "This was my third trip to Utila--I really love this place, but it is not for everyone. Utila is the smallest of 3 islands. It can be reached by ferry or air transport from La Ceiba. You can also fly to San Pedro Sula. I combined diving with Spanish school through Central American Spanish School. They also have a school on Roatan, La Cieba and Copan. Spending 4-6 hours per day diving and 4 hours per day in class kept me out of trouble during my stay. This time I dived with Deep Blue.This time I dived with Deep Blue. These folks were great. Small groups, mellow and extremely competant instructors as dive guides. The folks who lead the dives were experienced instructors all were very familiar with the reefs. I would highly recommend Deep Blue"
"Another good dive school on Utila...Bay Island College of Diving. " "I dived with Altons...they were fine. The dive masters were young, mostly inexperienced but competent and all were friendly." " I think Captain Morgan's was the most economical. They have their accommodation on a tiny cay called Pigeon Cay where there is a settlement of locals (very unique). I got certified there in 2006 and had a great time. " Scuba / Adaptive scuba Instructor & Dive Master school at the resort. Teaching scuba diving for certifications. Training people with disabilities to learn to scuba dive. Offer hostel stay and dive package. Diving Roatan's east end. "Jamie is a very patient and through instructor. He is knowlegable and helps a beginner feel safe and at ease in the begining stages of diving. I plan to go back next year and continue my dive training with Divers at Play. Excellent value for money because of the individual attention." "The Stevenson family (including Barry and little Liam) and the wonderful staff provide the experience of a lifetime. Unbelievable value for money. You'll leave thinking you cheated them! the trip was priceless. Never thought I'd say this since Grand Turk Island was also amazing but our experience at Reef House was the best!" A luxury beach resort set in its own glorious private cay with on-site dive center. A PADI Gold Palm dive centre and Divers Alert Network located right on the water in West End, Roatan. They have a 14 year history of serving their international clientele. The centre is owned and run by (according to the dive centre) "young, enthusiastic diving professionals who value quality and are working towards making our dive business environmentally sustainable. We are forever searching out new dive sites and finding new creatures and are proud of our commitment to safety, diving education and environmental awareness." "We stayed at CoCo View on Roatan in 2012. It is an all inclusive operation on the eastern end of the island. Dives sites were great with an easily accessible from shore wreck dive or wall site. Dive operation staff were excellent and very attentive. Two of our group members completed Advanced and Enriched Air. The instructors integrated the training with our groups dives. " "Honduras does have some great marine life and wonderful reefs. Spent 4 days at the Coco View Resort (an almost all inclusive divers resort). The staff were professional and courteous and the diving very, very good. In 3 1/2 days, we made 15 dives and could have done more. On our last day, we drove around the island and visited other potential dive sites - which would have been nice to see from under the surface. Of the 3 of us that went to Honduras - one had over 1,000 dives, one had about 200 and one completed his qual dives while there - the diving was able to satisfy all 3 experience levels. Many of the people at the resort were on the 10th or more visit." 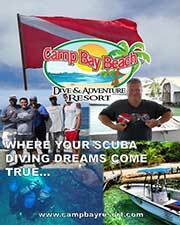 "We just got back from Roatan and stayed at Mayan Princess in West Bay where there is a PADI group called Mayan Divers. They were just awesome! Very personable and professional! Vera, Anja, and Liber were all very knowlegable and fun. A small operation with a very personal touch. Great dives every day!" "Coconut Tree Divers were very accommodating. Reasonably priced but I don't have much to compare them with. " "Go Pro Caribbean is located on the tropical paradise Island of Roatan in the western Caribbean in the Bay Islands of Honduras. Known as the cheapest place in the world to dive. The West End of Roatan has managed to keep its Caribbean charm thanks to its size, whilst other parts of the island have been developed quickly targeting cruise ship and short term vacationers, the West End still feels like it hasn't changed in 20 years. The road is still sand, with rickety wooden buildings on one side and beautiful white sand beaches on the other, lazy days off can be spent in the palm covered beach bars with the whole place just a 10 minute walk from one end to the other. Direct Flights from the United States (Houston, Atlanta) and Europe make Coconut Tree Divers the most convenient budget Caribbean destination out there. Also the home to Roatan Tec Team." Tel: U.S. & Canada: 1-866-215-1417 (toll free) and 1-310-734-4339. "I had been in contact and reserved my diving with Sureno del Mar but when I arrived, they said they had no opening for me. Subsequently, I found Coconut Tree Divers." The diving school Dive in Caribik opened in 2005 at the Hotel Palma Real. This was followed in 2006 by a second diving school on the Cayos Cochinos on the island Isla Paradiso. Both schools are under German management. "We are based on the uncrowded north east end of the island and are the only dive operator for about 5 miles. We have our own system of mooring bouys for our divesites. The dive shop has two boats, one large boat for up to 12 divers and a smaller one for two or three. We offer PADI courses from Discover Scuba to divemaster and some specialties. We are situated in the grounds of Marble Hill Farms which is an organic fruit farm and also has 3 two bedroom beach houses, 6 one bedroom sea view rooms and some dorm style accommodation as well. We also have a restaurant and range of other activities such as deep sea fishing, organic jam tasting, kayaks and excursions around the islands." "10 days on Roatan Island early August. Stayed at Anthony's Key Resort. My son got his OW cert and I completed Rescue. Peter and Tati run the public portion of the dive operation there and they are fantastic people. The rest of the dive crew are all very professional, and accommodating. Clean, fast boats, good captains. Hotel side of the deal was very nice. Good food, service and staff. Hurricane Ernesto prompted the resort to evacuate all of the guests for 24 hours. They handled the accommodations && transportation for all of the guests and kept us well informed. Had the boats reassembled and had us back in the water within 36 hours. Most all guests were impressed with how they handled a not so good situation. I would return just to see my new friends Peter and Tati. " Very nice place. New. Great rental equipment and fast boat. Excellent value. Our package included all meals, accommodation, dives and tanks. ~Fast boat. Good access dive ladder. Every diver had a good space for gear under the seats. Great for small dive group or club to rent the whole place out. Enjoyed the tiki bar drinks. The place was completely rebuilt and had all brand new Diving Equipment and new dive boats. Smaller panga types but fast and perfect for the location. A friend mentioned to me she was going to Mexico for Spanish language school, primarily because this particular school included surfing as part of the program. It was this conversation that inspired me to look into Spanish language schools in a country where I could dive, run rivers or go surfing. Not only would I have a possible tax write off, but also a chance to develop my Spanish language skills. After spending several hours on the Internet looking up language schools in different countries, I decided on Honduras. Honduras is a wonderful country. As stated in the Lonely Planet: Honduras is the original banana republic. It is a democracy with a developing economy. The national language is Spanish. However, English is dominant on the Bay Islands. Honduras has incredible natural resources including world class whitewater boating and some of the best (and cheapest) diving in the Caribbean. Central American Spanish Schools seemed to have the most comprehensive program and a school on the island of Utila. They also were the only school to offer medical Spanish as my travelling companions, Viki, Dee and Lois, were emergency room nurses and needed the Spanish for work. Rafael, the director, answered all my questions. He responded to my e-mails the same day I wrote them. Best of all the price was right. Our first week was in the coastal city of La Ceiba. La Ceiba is also the port for the Bay Islands and base for river trips in the Pinto Bonito National Park and Cangregal River. Every day we had different activities including: treks to the rain forest, river canopy (zip lines), dancing and classes on the beach. On Friday, we went to Oscar Perez's Jungle River Lodge where we hiked through the verdant rain forest to a 600 ft (183 m) high waterfall. The next day we went rafting through the precipitous drops of the Cangregal river gorge. I am a whitewater outfitter in California; Viki, a class V guide and Dee a Class V kayaker: we were all impressed with not only the river but with Oscar's guides (Johnnie, Ricardo and Juan) and his entire operation. Unfortunately, Lois had torn ligaments and could not partake on our adventure. The next morning we caught the ferry to Utila. I dived with Altons because that is the shop the school uses. They were fine. The dive masters were young, mostly inexperienced but competent and all were friendly. Dee did her certification course through Altons, they were able to work around her school schedule and she felt her instruction was proficient. I have also heard very good reports about Deep Blue Divers. This dive resort and shop is owned by an English couple who claim that Honduras is the cheapest place in the world to dive with the the world's second largest barrier reef. Lodging and food in Utila are as cheap as Thailand. We stayed at the Colibri Hotel. We had a large room with 2 queen size beds and hot wate. For non divers, Viki and Lois spent an afternoon on Water Caye (a small white sand island with palm trees and no sand flies) an afternoon snorkelling, a hike to Pumpkin Hill and explored some of the caves. There is also horseback riding, shopping and people watching. But be prepared, the bay islands are renown for some of the most aggressive no-seeums anywhere. Bring lots of repellent. In conclusion, my only regrets about my trip is that my travel was confined due to taking the classes. I would have really liked to visit the ruins at Copan but that was on the other side of the country. If you travel with Taca Airlines be prepared to have your luggage delayed. This is a common event of this airline. It was nice to have Rafael as an advocate to hasten the process of getting our luggage to La Ceiba. The cultural experience of not only getting to know, but become friends with the Honduran people I met was priceless. In addition we made many international friends with other students. The diving was extraordinary. The experience was phenomenal. A luxury beach resort set in its own private cay with on-site dive center. Affiliated with the Utila Dive Center. If you have more information, or a question, about diving Honduras we'd love to hear from you. Send us your comments below or fill in our more detailed diving review form.